We design beautiful and thoughtful spaces. We believe in collaboration with clients first and foremost. We believe that a well designed home can positively affect your life. A well designed kitchen can make you a better cook. A well designed workplace can make you more productive. Natural light can make you happier. Natural materials can make you feel better. We believe that a well designed space is the best background for living and working. When it’s right, you’ll feel it before you see it. We've designed comfortable and livable homes for families of all shapes and sizes. We are known for stylish, spacious interiors with lots of natural light. A well designed space is the best background for living. We have extensive experience designing interiors for offices, lobbies and meeting rooms. We love working with clients to design an innovative and productive workplace that reflects their vision and brand. If you need your guests to have a unique and unforgettable experience, we provide premiere hotel interior design resulting in beautifully organised interiors which also work operationally. Modern design combined with treasured heirlooms for an eclectic and relaxing retreat. A city couple looking for a place to escape to in St. Helena, in the Napa Valley of California, built this modern home, designed by Butler Armsden Architects. The double height main room of the house is a Living Room, Breakfast Room and Kitchen. It opens through sliding doors to an outdoor Dining Room and Lounge. We combined their treasured family heirlooms with sleek furniture to create an eclectic and relaxing sanctuary. 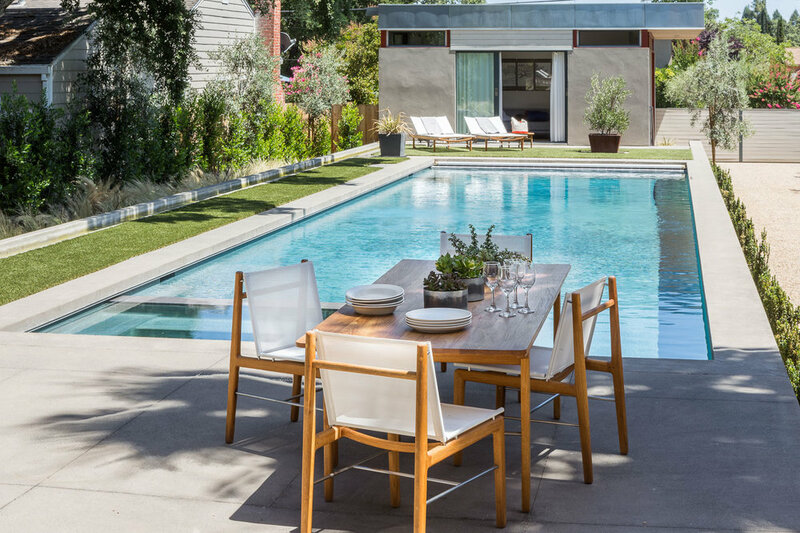 An outdoor dining room provides a refreshing spot for family meals. Our clients spend most of their time in this airy, double height space. The Master Bedroom features an antique desk and mirror mixed with minimalist Italian furniture. Pristine floating shelves hold treasured family heirlooms in the guest suite. Modern design mixed with rustic furnishings for a classic family home. She's a little bit country and he's a little bit rock and roll. We combined rustic furniture, lighting and accessories with this ultra-modern Italian stainless steel kitchen in this remodel of a family home in Marin County for a family with two children. A seating area at the island provides a prime view of the chef at work. Our client is a former professional chef who wanted a high performance hard-wearing kitchen that was also beautiful. We combined restaurant grade appliances and fixtures with super durable stainless steel cabinets and counters with natural stone on the walls and island. The stainless steel sink and counter were welded together for a seamless transition. A historic Victorian mansion gets a modern kitchen perfectly suited for a couple who loves to entertain. With two children away at college, these empty nesters are hosting dinner parties for their friends again. We designed a cook's kitchen for her that includes professional appliances and special zones for the different stages of preparing a multi-course meal: prep, cooking, staging and plating. Each with coordinating custom storage and special amenities, like a countertop chute in the prep area that leads straight to the compost bin. For him, a handsome bar with floating shelves to display special bottles and different glasses, a dedicated beverage refrigerator and a sink that doubles as an ice bucket for chilling and serving several bottles at a time. Cin-cin! High ceilings provide extra storage and tall windows flood this space with natural light. A separate bar for him is perfect for entertaining and provides space for mixology concoctions. Stone niches for appliances and condiments keep the counters clear for prep and staging. In collaboration with Page and Turnbull and BMOD, we converted an existing attic space on the 11th floor of the One Kearny building into a conference, meeting and event facility with an outdoor terrace and panoramic views. We capitalized on the existing steel structure to create an exciting and dynamic oasis in the sky.